Welcome to Monitor - any comments or questions email [email protected]. You can download this issue as a pdf file from https://www.windmill.co.uk/monitor/monitor235.pdf. Analogue output signals tend to fall into one of two broad categories: control and waveform generation. When used for control analogue signals are generally slowing changing. The computer software might be monitoring one or more input signals and using these to calculate a control signal. Alternatively, the computer may generate an output voltage as a stimulus prior to measuring the response. The second category of analogue output is that of waveform synthesis - where the output signal changes several million times a second. In both these categories, a digital-to-analogue converter is used to generate the signal. For waveform synthesis the analogue output will be a voltage signal. For control the output may be a voltage or a current. Analogue output hardware comes in many guises, including units which connect to the computer over a USB, Ethernet or wifi link. The hardware suppliers quote various specifications for these devices, including: Range, Resolution, Slew Rate, Settling Time and Linearity. It's not always clear, however, what they mean by these terms. The maximum and minimum voltage or current that can be generated. The range may be bipolar, covering a range of -1 V to + 1 V for example; or unipolar, perhaps covering a range of 0 to 10 V. Many systems offer a choice of ranges, which you can select through either software or hardware. It's best to choose the smallest range spanning the output you need, as this optimises the resolution. The resolution is the number of steps into which the output range is divided. The resolution is normally expressed as bits (n) and the number of steps is 2n-1. This equates to 2n values. A converter with 12-bit resolution, for example, divides its output range into 212 or 4096 values. In this case a 0-10 V range will be resolved to 0.25 mV, and a 0-100 mV range to 0.025 mV. The output is thus not truly analogue but an approximation. How close the approximation depends on the resolution. Slew rate is the maximum rate of change of the output signal, measured by the rise in voltage divided by time. Slew rate is expressed as volts per microsecond. When the D-A converter changes from its minimum output level to its maximum, the output signal swings through its "full scale". The settling time lets you know how long it will take the output to settle to its final voltage. It is normally given as the time to settle to a percentage of the full-scale voltage or current range, following a full-scale change in the voltage or current. Ideally a D-A converter with n-bit resolution will convert the input range into equal steps. In practice the steps are not exactly equal, which leads to non- linearity in a plot of D-A output against output signal. This is expressed as a percentage of the output's full- scale range. Waveform synthesis devices need a memory to hold the points used to generate the waveform. Memory may be expressed as the maximum number of points: 2 M (two million) for example. Alternatively the memory may be shown in bytes. For example, if you had a 12-bit D-A converter each point might occupy two 8-bit bytes and in our example the memory would then be 4 Mbytes. Typically you use software to synthesise the waveform, storing the points in the memory. The memory contents are then scanned into a D-A converter at the required speed - often regulated by hardware for precision. Lastly a buffer amplifier drives the actual output. The Microlink 752 provides analogue control as well as other facilities - see details. "Hi, I'm interested in your 750 DAQ module, just have a few of questions! Is it configurable to measure 4-20mA signals? Does it allow the user to program the data sampling rates and allow logging of average values? Can the data be seen 'live' as it is logging? " Yes, you can use the 750 to measure 40-20 mA signals - to do so you need to add a 590-8A Current Connection Box. You can choose the data sampling rates with the Windmill Logger software and see data live as it is logging. It won't log average values though: for this you need to transfer the readings to, for example, Excel. 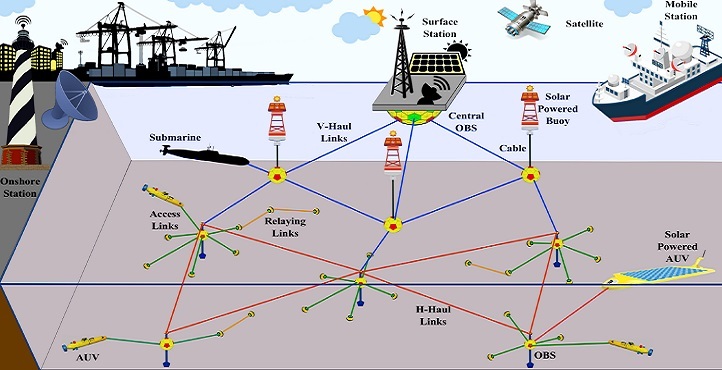 Oceanic sensor networks that collect and transmit real-time data could transform our understanding of marine ecology and improve pollution and disaster management. Researchers have developed a system that can produce images of objects shrouded by fog so thick that human vision can't penetrate it. It can also gauge the objects' distance. Ultrasound is often used in engineering to detect cracks in metal components, but if the surface to be tested is not perfectly flat the emitter cannot always make a good contact on the component and the technique cannot be used. Researchers have developed a low-cost, easy-to-use sensor which can test drinking water for arsenic in just one minute.